Before we climbed the mountain ranges of Kibungan on January this year, we visited some group of locals in the area such as in Bukan and Palina, Kibungan. We had forum on mining. These fora were facilitated in the presence of Bishop Utleg who is the current chairman for National committee on Indigenous Peoples of the Catholic Bishop’s Conference of the Philippines. 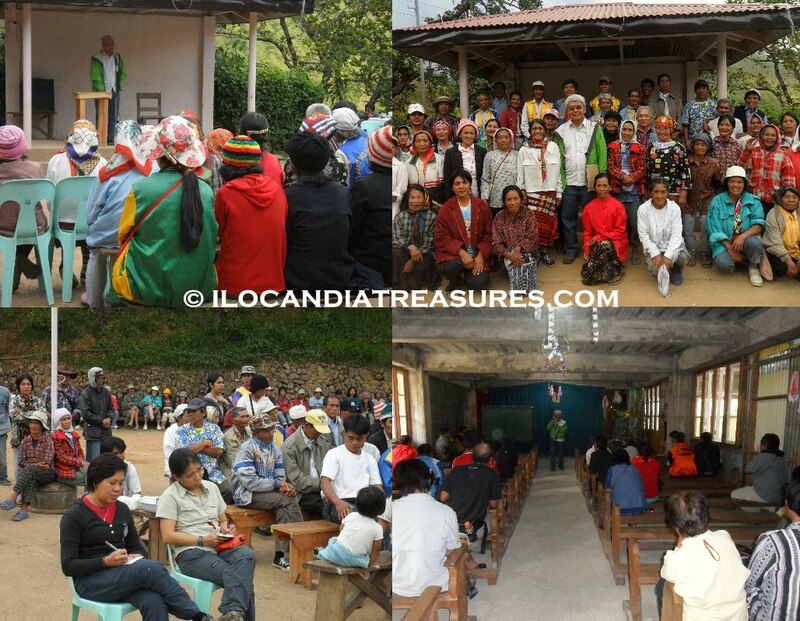 The indigenous peoples have presented their sentiments, views and facts regarding mining in their respective places. We listened to their speeches as Bishop Utleg responded to their battlecry and supports it. 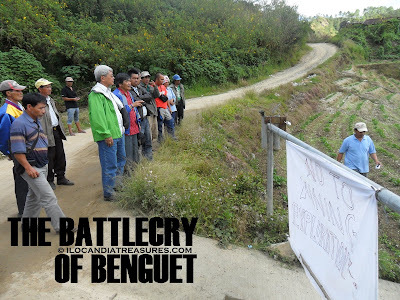 The locals expressed firmly their disgust over the issue and they are truly against lobbying of the mining exploration efforts. According to them, there were few families who favored the issue but they are not the representatives of the community. Our group specifically the Laoag Mountaineers Club is supporting them not to allow mining explorations in the area because it will destroy and corrupt their rich natural resources. The locals also fear that water may be depleted and may not be available for their fields. On the lighter side, I appreciate very much the local people especially the old folks for they are so very warm and kind. They talk with sincerity and heart. They even dance with the guests like me. They prepared snacks composed of native delicacies. I had so much fun interacting with them. Again, I would like to reiterate that they should stop mining exploration in the province of Benguet. Let’s protect the environment, let's preserve Mother Earth! Panagbenga or Flower Festival was once again celebrated in the City of Baguio. 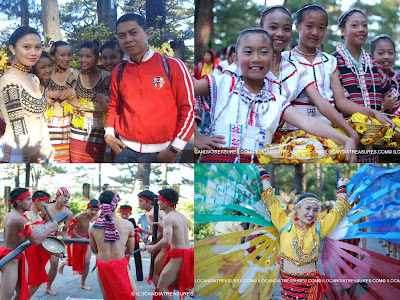 Baguio is popularly known for its cool and mild climate that made her as the Summer Capital of the Philippines. The subtropical highland climate is attributed to its location at an altitude of 5,100 feet that makes it conducive for the growth of mossy plants and orchids from which the name of Baguio was derived. It was taken from the Ibaloi word bagiw meaning moss. It was truly cold when I arrived in the city. At seven in the morning everybody was preparing for the Street Pageantry. The spectators were lining up the sidestreets for them to catch a better view of the dance parade. I rushed to the area of Baguio Convention Center where the dancers assembled. I had seen the Philippine Military Academy cadettes and the city officials getting ready. 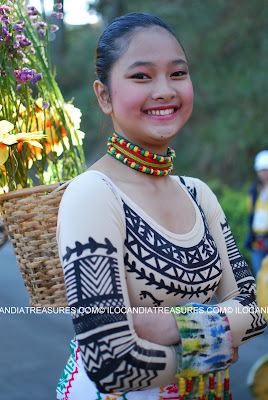 As I approached the group of dancers, I saw colorful ethnic costumes of Igorots, Ibalois, Apayaos and others. Some of the children were even shaking with the cold much so that they wore the g-strings. 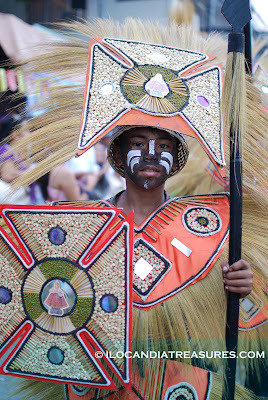 Aside from ther native costumes, they were garbed of flowers of different sizes and colors. These natives of Cordillera Region started to dance after their formation. They swayed their bodies to the blended tempo of ganzas and drums. 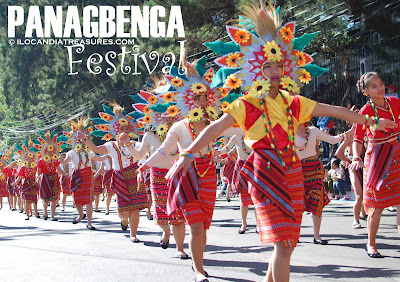 It is called the Baguio beat accented with the Panagbenga Hym. 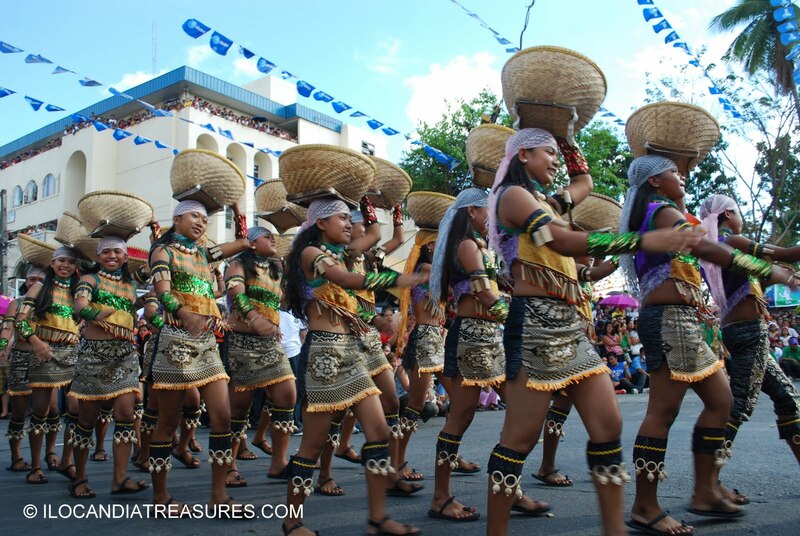 Their dance steps were inspired by the Bendian, an Ibaloi dance that came from the Cordillera region. 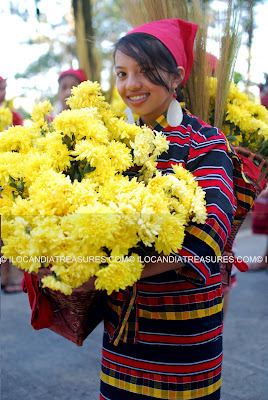 The Kankanaey term panagbenga means the season of blossoming. 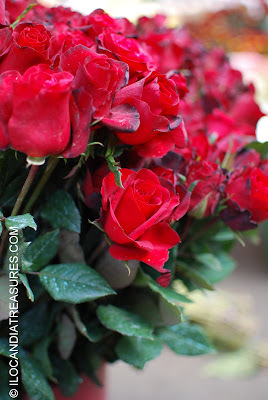 Baguio is the place where flowers tribe and harvest is made anytime of the year. This is a month-long annual flower festival that started in 1995 to give tribute to the city’s flowers and to feature the cultures, traditions and rituals of the indigenous peoples. 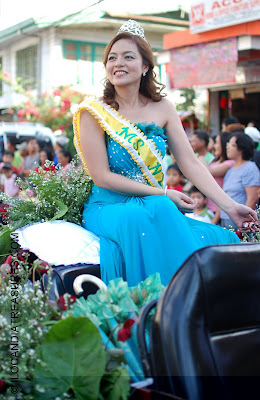 Aside from the grand street parade, several activities were lined up for the guests and the community such as market encounter, fluvial float parade, session road in bloom, tourism fair, grand float parade and the fireworks display. 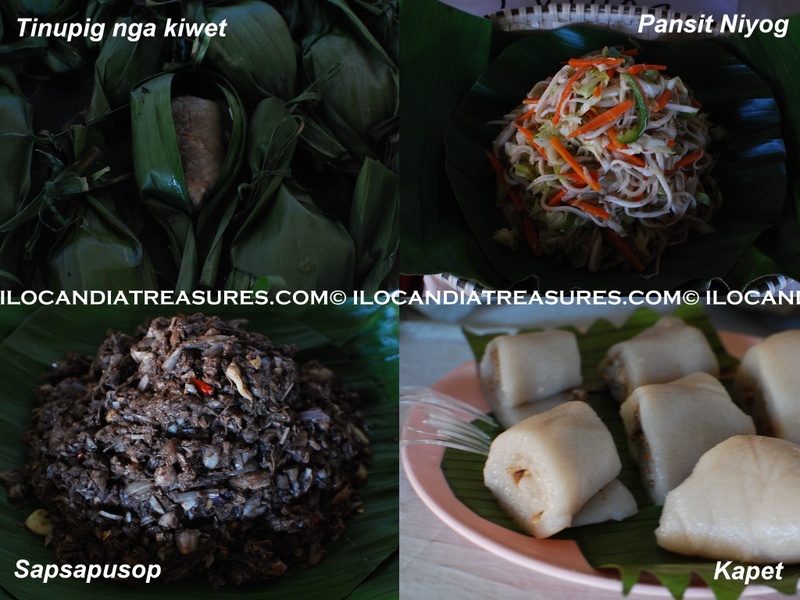 Tinupig nga kiwet – is a grilled eel wrapped in a banana leaf. Sapsapusop - is a stir-fried banana blossom. Pansit niyog – is a stir-fried noodle-like shredded coconut meat mixed with other vegetables. Kapet – is made of glutinous rice. Its tikoy but rolled with latik. Itlog ti buos – is the ant’s egg. It is usually harvested during the summer season from the leaves of mango tree. Its an exotic food. This is sauteed in garlic and tomatoes. Igat - eel that has been broiled. Pocherong Ugsa – is a Tagalog dish with pork but added with dried venison. It is a stew composed of cabbage and ripe bananas. Crispy dinardaraan – is crunchy pork sided with blood sauce. Tinubong nga red rice – nutritious red rice is placed in a bamboo tube and was cooked in it. 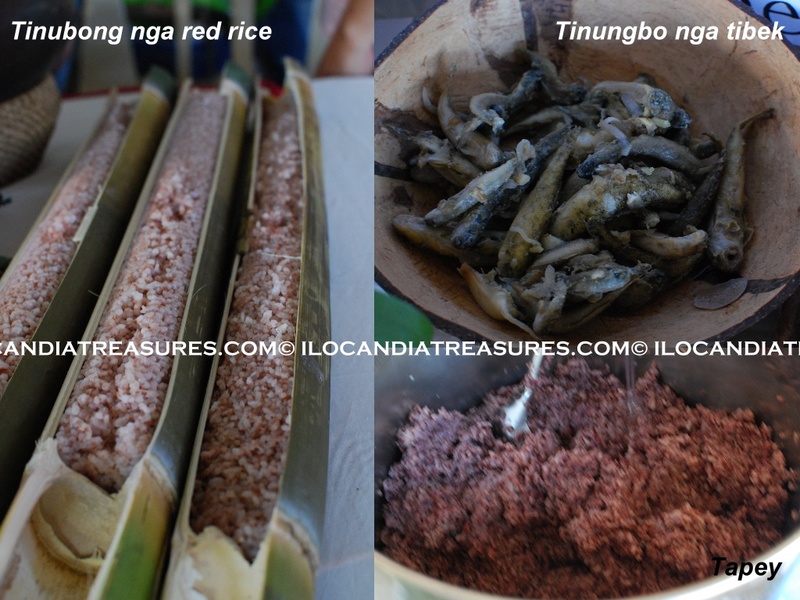 Tinungbo nga tibek – it’s a finger-sized fish cooked inside a bamboo tube. Tapey – fermented red rice that can intoxicate. It is the origin of the rice wine. 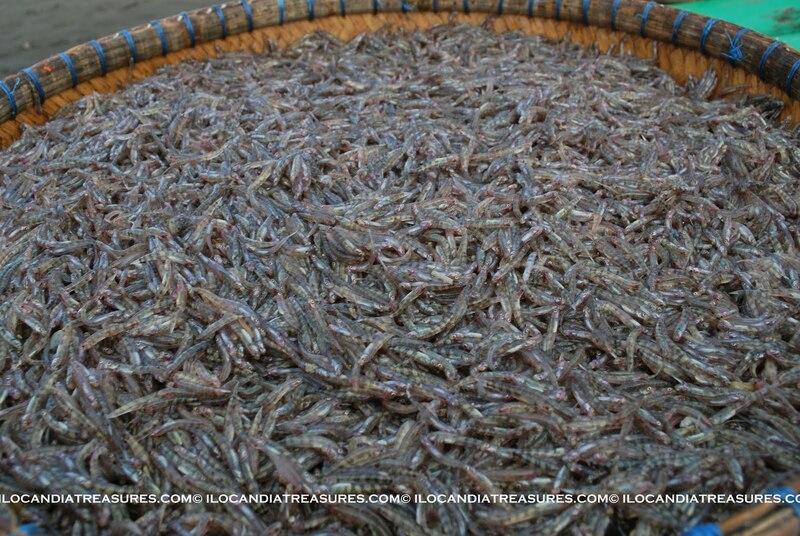 When I first heard of the word ipon I thought it was hipon (shrimp). It was a totally different fish. 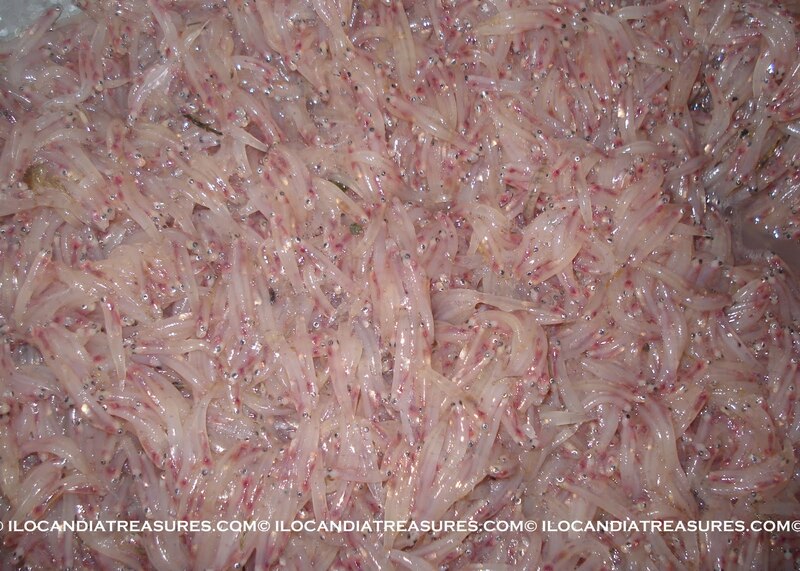 Ipon is actually very tiny specie of fish being caught only in season. It appears in the months of early as August, September, October, November, January to late as the month of February. It’s a newly zygote fish, with the scientific name of sycyopterus lachrymosus. 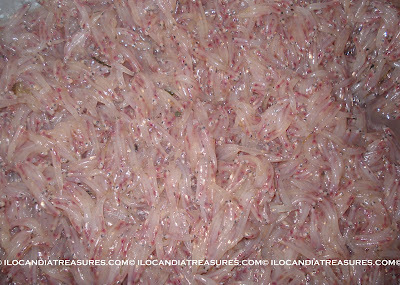 This small fish that measures about 1 inch in length and ¼ inch in diameter is only endemic to the provinces of Ilocos Norte, Ilocos Sur and Cagayan Valley. It is also called a lunar fish because they only appear after counting ten days from full moon. They can catch this fish from 3-5 days once in a month. Fishermen make one harvest in the morning and one in the afternoon. I have asked the old folks where does ipon comes from. I was told of a theory that a huge egg hatch in the middle of the water. Another is that it comes from the sea water to migrate into the river water and later on when it grows bigger it becomes the bukto. Still a mysterious fish. I was lucky to cover and document this catching of ipon in the fishing village of La Paz in Laoag City two years ago. 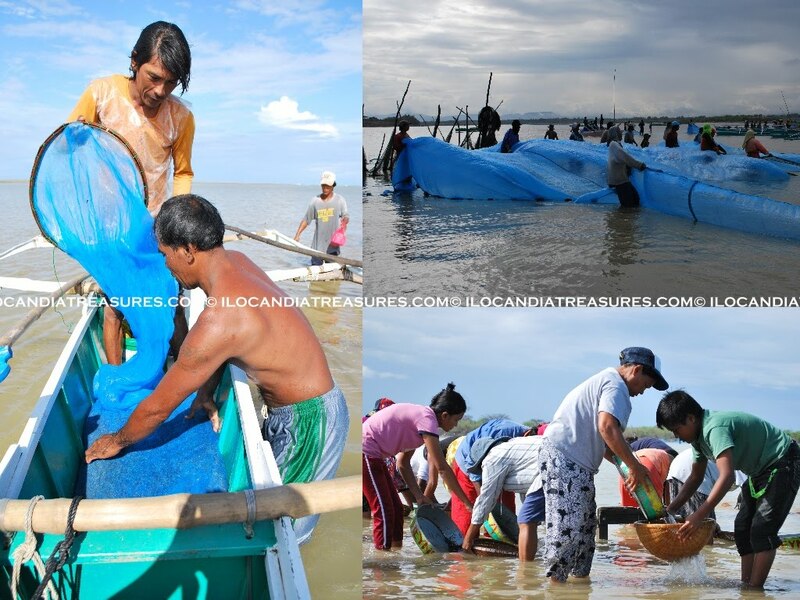 Village folks were so kind to take me by the boat to the center of the puyupuyan or estuary of La Paz where the ipon are. I saw men do the daklis, pulling the huge net, helping each other to trap the fish. 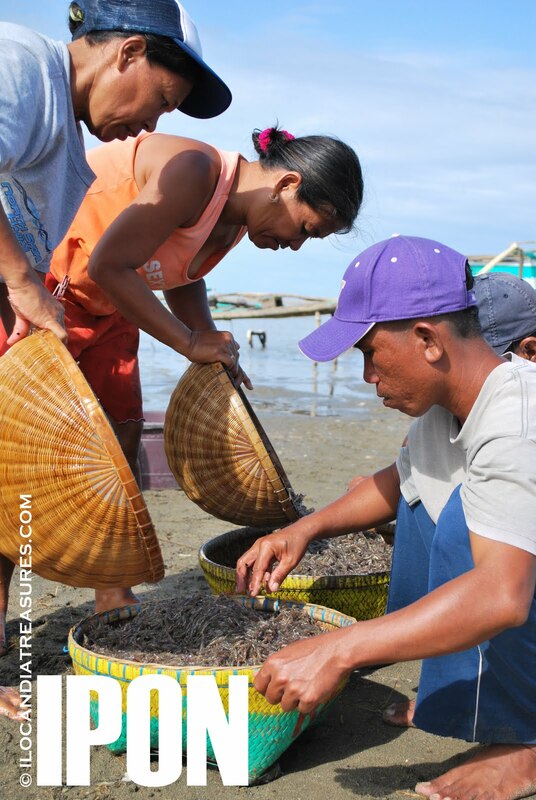 They transfer their catch to the boat and bring it to the ladies on the river bank for them to wash and clean by the use of gakko, a woven strainer. They again place it to the banyera and dispose it in the wet market of Laoag. 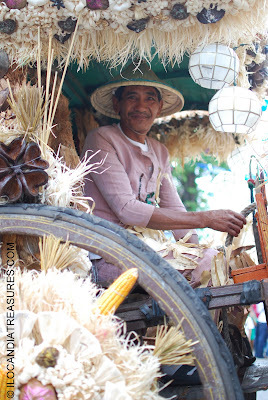 I was just amazed that people in Laoag City go crazy over ipon when it is in season. 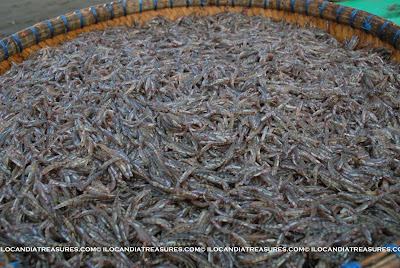 Most of the locals trooped to the market to buy a kilo or so of this very tiny specie of fish called ipon in the vernacular. One can see a lot of people especially on its first time of harvest. Even if it’s expensive on its first release at a rate of Php 300-400 per kilogram, they would grab it. They wouldn’t mind the expensive price as long as they can get some to cook and eat for dinner or lunch. It is truly a delicious fish when it’s cooked. 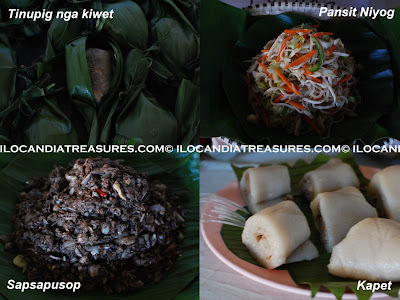 It is cooked as nilengta (steamed), kilawen (raw) with onions, vinegar and ginger, torta (with a scrambled egg), paksiw with vinegar and salt, sinigang (ipon soup with tomatoes and ginger), adobo, or even grilled ipon wrapped in banana leaf. 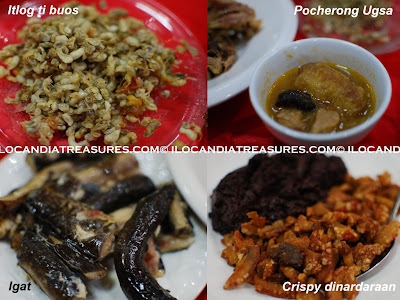 People from Ilocos Sur also cooked it as a tinubong. 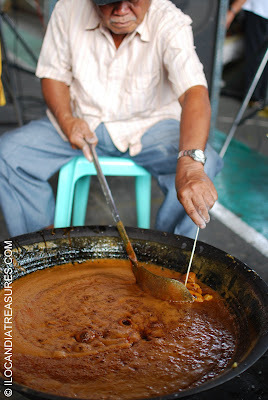 To use it for long they turn it into ipon bagoong. Because of its delicious taste, Ilocano communities in the United States especially Hawaii can’t stop but order bulk of ipon when they come home or request somebody to bring it for them when they couldn’t come. They store it first in a freezer here before they transport it and fly. 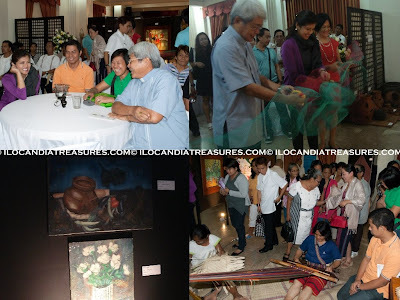 The Kalinawa Art Foundation and the Provincial Government of Ilocos Norte have recently held an Indigenous Peoples’ Vistual Art Exhibit in Laoag City. 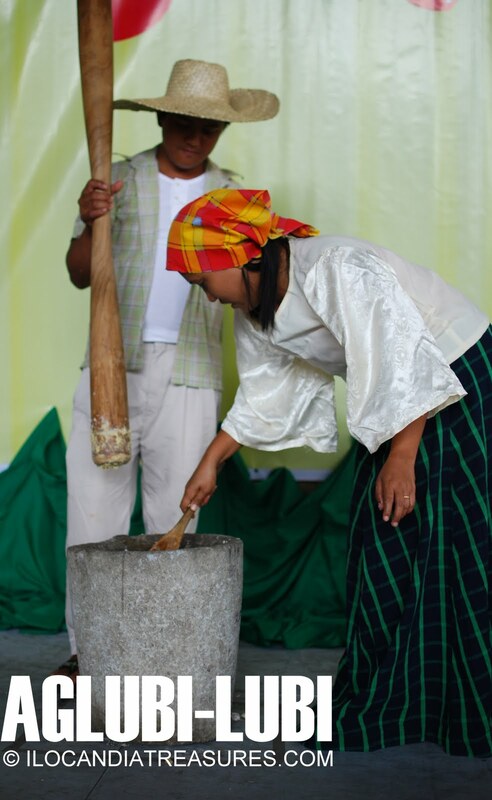 This project has the objective of promoting the talents of the indigenous peoples and to celebrate culture. Most Rev. Sergio L. Utleg, D.D. 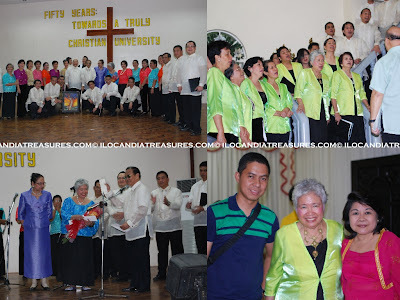 (National Chairman, Commission on Indigenous People of the Catholic Bishop Conference of the Philippines), Hon. Imee R. Marcos (Governor, Province of Ilocos Norte) and Mrs. Raquel Palma Gil (KAF Executive Director) officially opened the exhibit by cutting the ceremonial ribbon. Prior to this, they each delivered their messages to participants and guests. 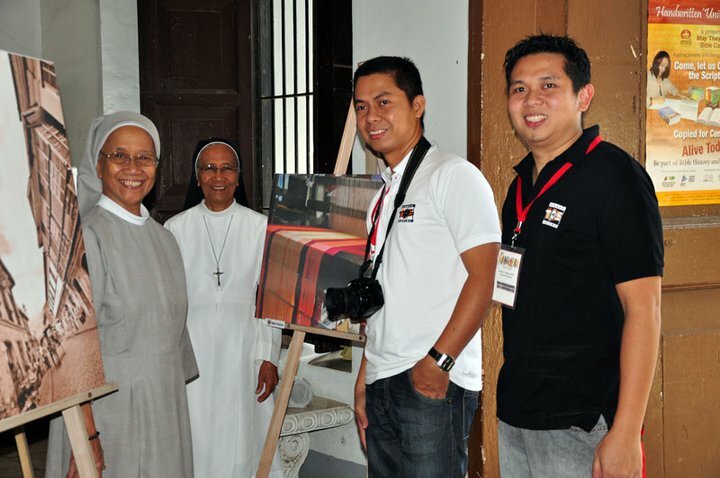 Participants in the exhibit were indigenous peoples of Adams and Nueva Era. Some young IPs displayed their art masterpieces. Colorful paintings with interesting subjects were posted on the panels. Handicrafts also were shown during the exhibit. 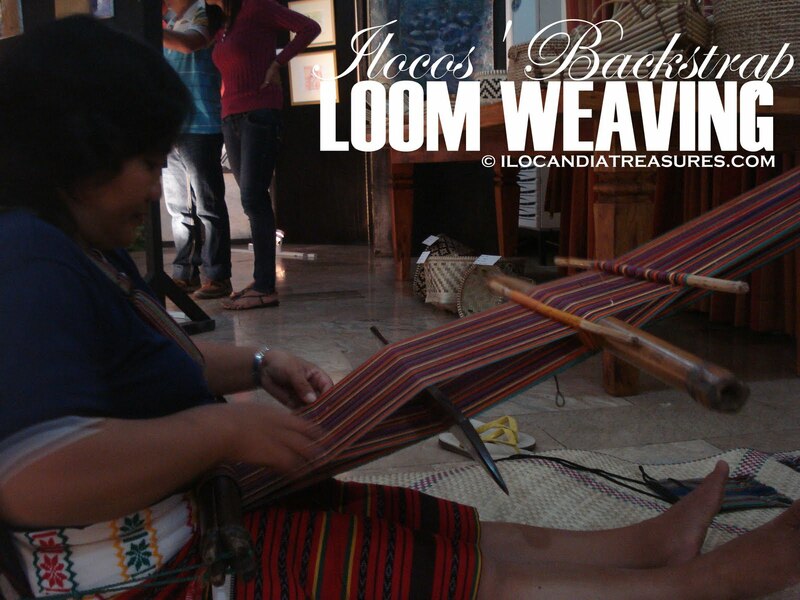 There was even a demonstration of the backstrap loom weaving by an IP from Adams. This is now very rare to see According to her, she was thought to do it by her mother. It’s only her and her sister do this weaving. I suggested that they have to train young girls to do this and pass it to the next generation. The only problem they have is procuring materials and they are expensive. I was reminded of the same weaving I have seen from a museum in Washington DC where a Guatemalan lady demonstrates weaving Mayan textiles for the tourists. Another wonderful rendition of the Manila Concert Choir during their performance in Laoag City was the nationalistic song entitled Ikaw at ako, tayo ay Filipino. Here is the lyrics of the song. 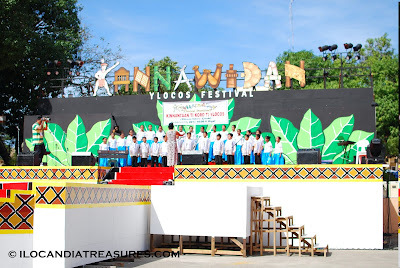 The province of Ilocos Sur has recently celebrated its Kannawidan Ylocos Festival. This year marks the province’s 193rd year based on the Royal Decree dated February 2, 1818 separating Ilocos Sur from Ilocos Norte. Prior to this date, the stretch of Bangui in Ilocos Norte down to Luna La Union is called Ylocos which is a term to refer to the coastal inhabitants. It literally meant “from the lowlands”. 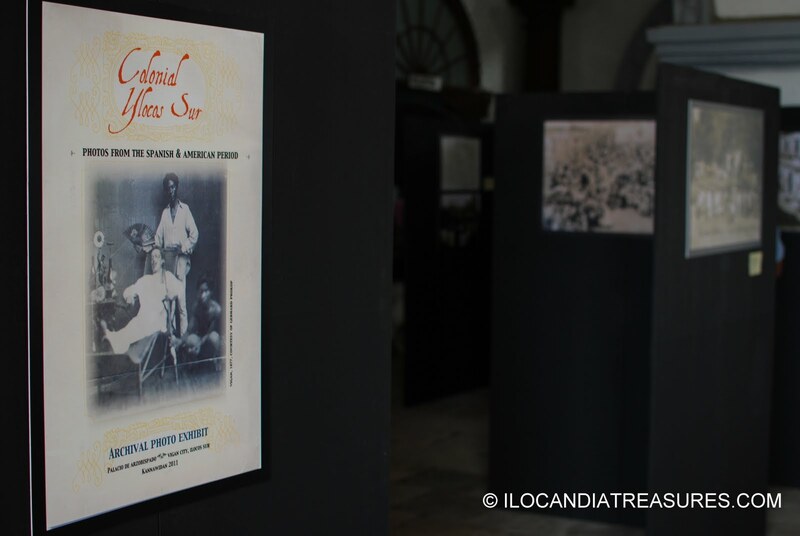 Ilocos Sur especially Vigan is branded as the Heart of Ilocandia by the Philippine Historical Committee. It’s a province very rich in culture and heritage. 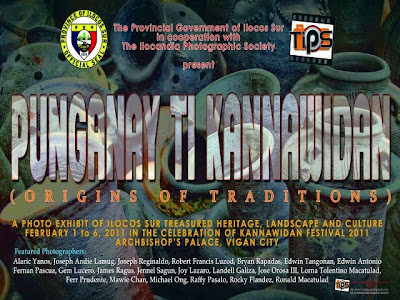 Kannawidan means traditions and this province got to showcase all what she has. On January 31 to February 6, 2011 several activities were lined up for the celebration. There was the tribal performance of the cultural communities of Ilocos Sur which is so fascinating. 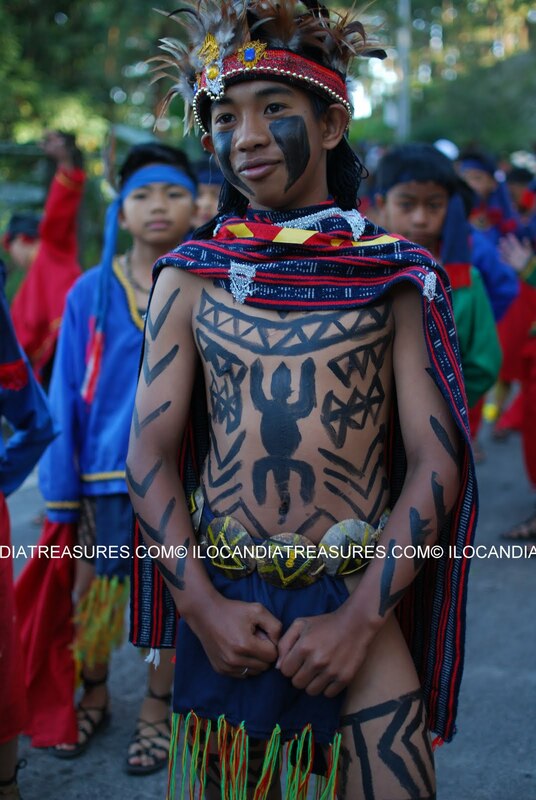 They displayed their talents as well as their indigenous costumes. Partuat ken Patanor Trade Fair showcased the products of the province such as longanisa, bagnet, garlic, bibingka, tinubong and many other foods including handicrafts. There was even eating contests of these delicacies of Ilocos Sur as well as basi drinking contest. Traditional games were played and bingo as well. 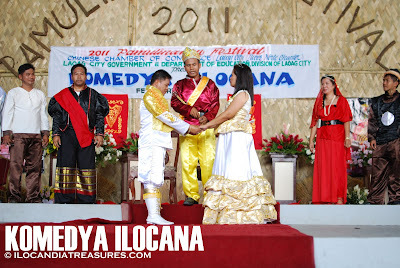 There were Sarsuela and Komedya Ilocana which were shown. Choir competition was also held. 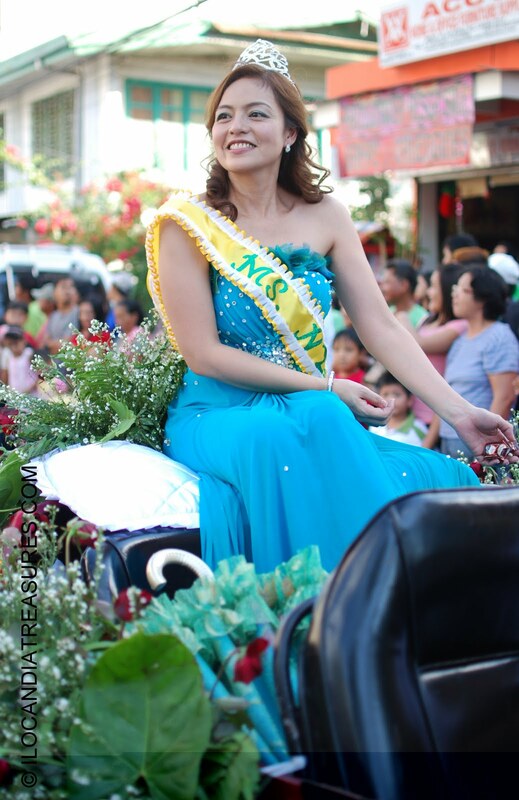 A battle of brains and beauty was witnessed during the Saniata ti Ilocos Sur pageant. Art exhibitions and competitions were also conducted. On the spot painting was done by the Saturday group from Manila while The Ilocandia Photographic Society put up its photography exhibit at the Archbishop’s Palace. It was a fun-filled week of celebration of the Kannawidan Festival in Ilocos Sur. 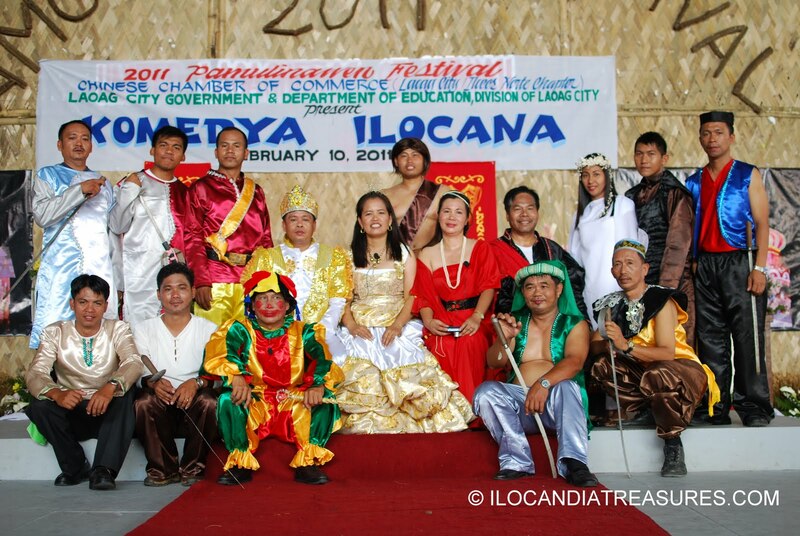 It has been a tradition that a stage play called Komedya Ilocana is being showcased to the community in celebration of the Pamulinawen Festival. 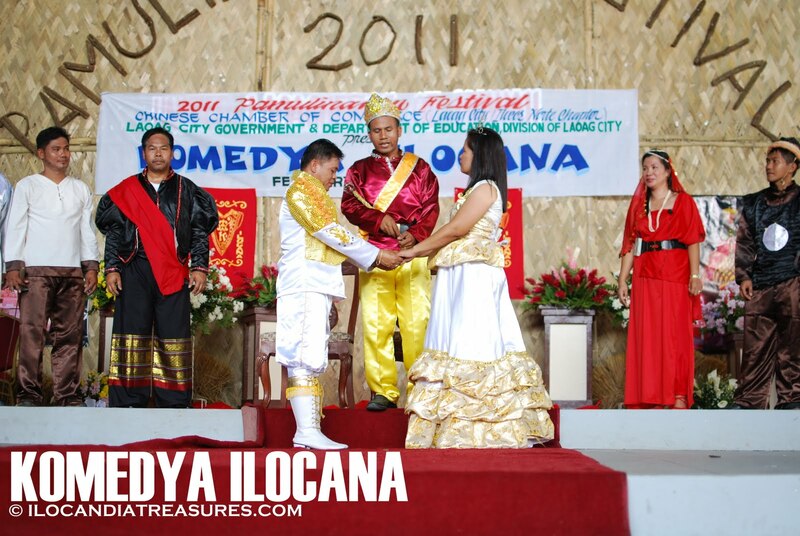 Komedya is a colorful theatrical performance show. It is just so sad that few people watch this. It is a dying performing art. This is my second time to watch this in Laoag and I saw the same people. I had the chance to talk to one of the organizers and she said that they need a special stage with a curtain for their show. They need also good sound system and lightings. It was traditionally held in the evening time to give a good dramatic viewing. In the olden days, people would really watch out for this. It is a series of show and they really go for it with their friends and follow this play everyday. It is like following soap operas in the modern day. Komedya is one whole book of story. The one they had shown during the fiesta is just 1/10th of the story. This is a serious show with humor. It’s a story with a setting in Europe and Arabia. This play was introduced to us by the Spaniards during the colonization of the country. It is also a method for them to spread Christianity. This is a secular komedya which is typically a moro-moro fight. It portrays the clash between Muslims and Christians where a forbidden romance of a prince and princess would end up by conversion of non-Christians to Christianity. 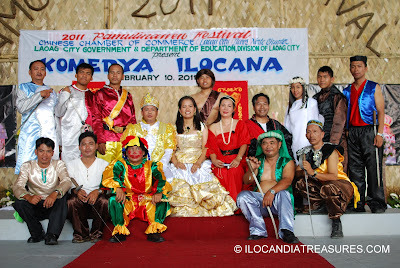 Elementary teachers in their colorful royal costumes were the cast members. They really have to use prompter to deliver their dialogue which makes it dragging sometimes but they performed well nevertheless. I guess in putting up a better show, a good financial support to stage this play and to inject innovations to make it more interesting and appealing are necessary. I am sure this would catch the attention of many people. The grand parade of Pamulinawen Festival is a showcase of small and big floats from different towns of Ilocos Norte, barangays, business establishments and schools in Laoag City. With these floats are their muses and queens waving to the crowd. These are participated in by some local beauty queens and from the state of Hawaii. 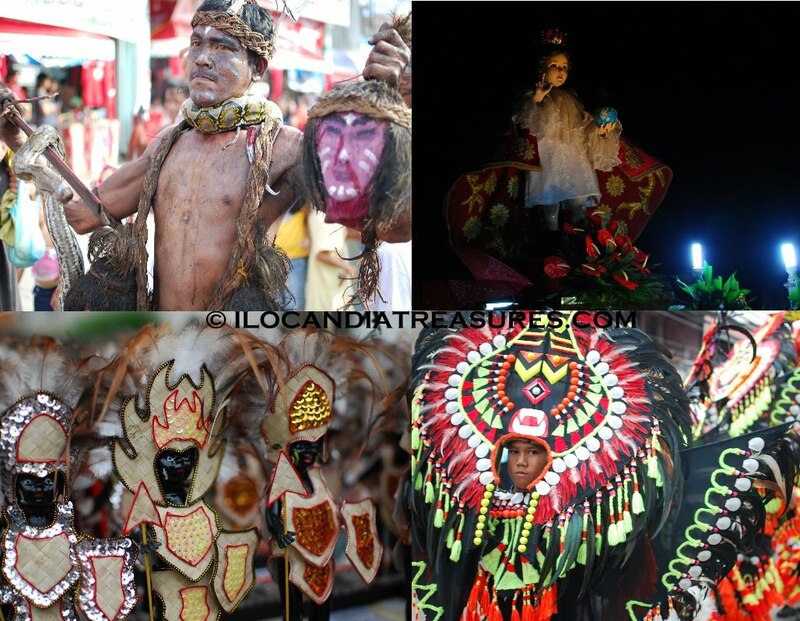 This grand parade in Laoag is a showcase of the creativity of Ilocanos and it’s by open invitation. 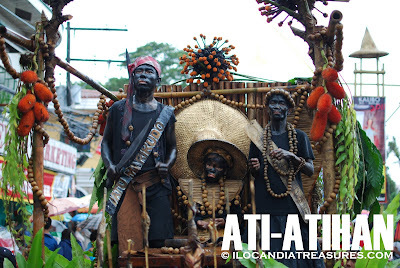 Most of the floats were decorated with flowers, plants and of course the indigenous materials that the winners made them win. There were miniatures of Ilocano equipments and ornamens paraded such as the dadapilan, burnay and others. I am happy that the float that won on the small float category was from the town of Solsona. It’s the same float we judged as the best one when I was invited to their Gameng Festival recently. 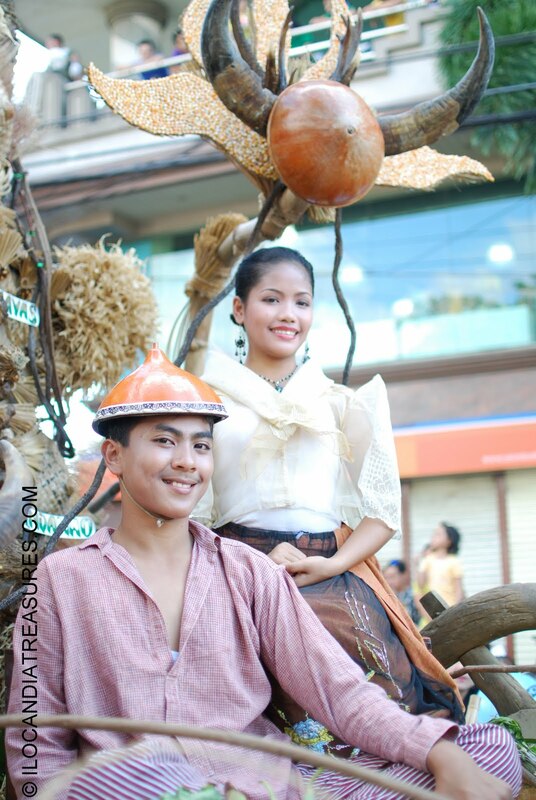 I was impressed with their float because it was made of hay, bamboos and other indigenous materials. There was even the carabao’s horn and the cap made from the skin of a vegetable called tabungaw. The big float winner is the float from Piddig. They depicted their basi production in their town. It’s a sugar plantation with children in mudpacks. The boys were arranged dramatically. At first glance, I thought they were not real. 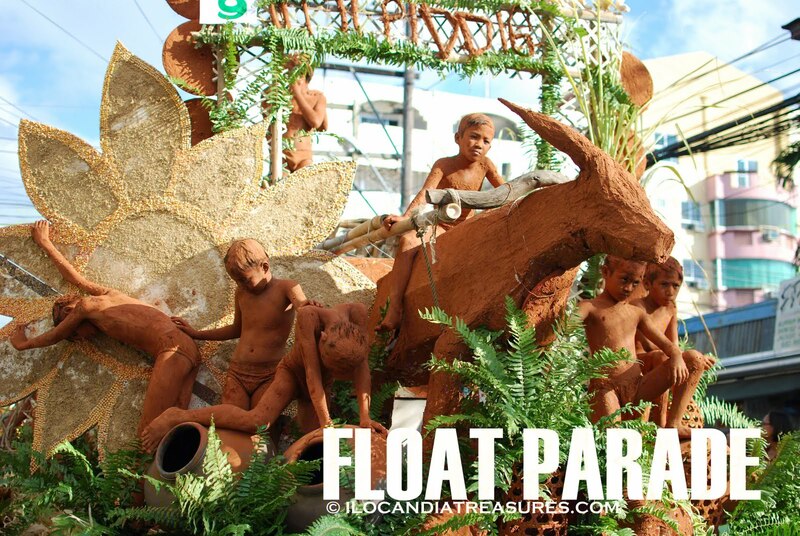 This float wowed the crowd and took home the grand prize. 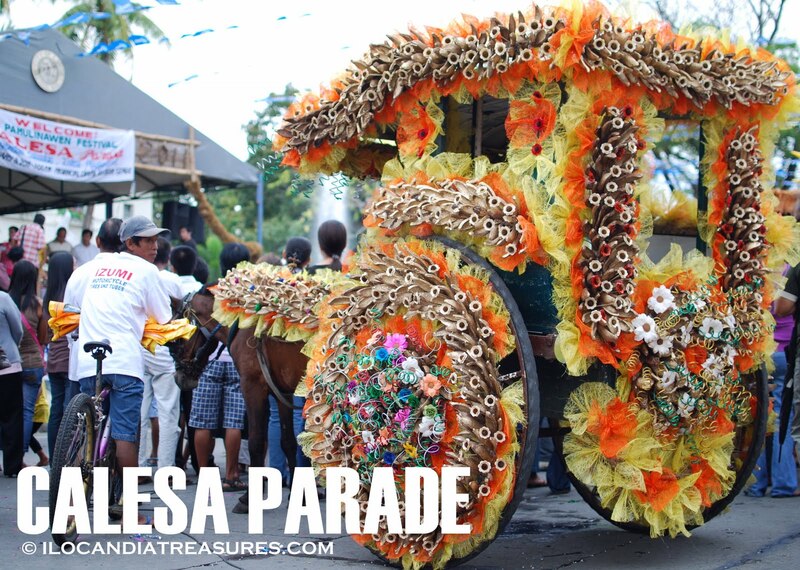 The celebration of the Pamulinawen Festival would not be complete without the Calesa Parade. It’s a showcase of one of the treasures of the city that is the calesa. This is a horse-drawn calash or carriage that still plies the downtown of Laoag to take tourists and commuters to their destinations. This celebration is a very good way to promote and preserve calesas. We seldom see nowadays calesas in the country. As far as I know, you only get to see them in Laoag, Vigan, Intramuros, Binondo, Iligan City and some parts of Cagayan Valley. Kalesa or karitela is the mode of transportation in the Philippines in the 18th century as introduced by the Spaniards that only nobles and high officials could afford to ride. 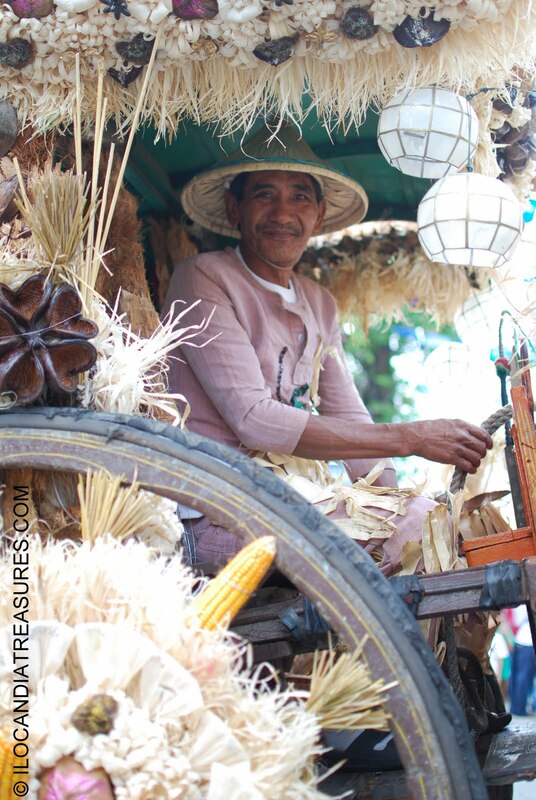 Only rich Filipinos called illustrados used this mode of transportation to bring their goods to nearby areas. 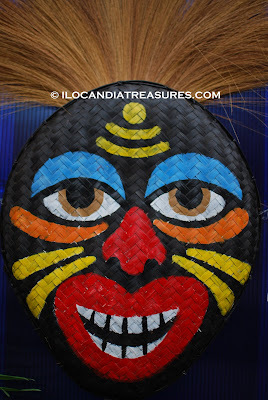 It is being handled by a kutsero or cochero that orders mano to turn right and silla to turn left to the horse. 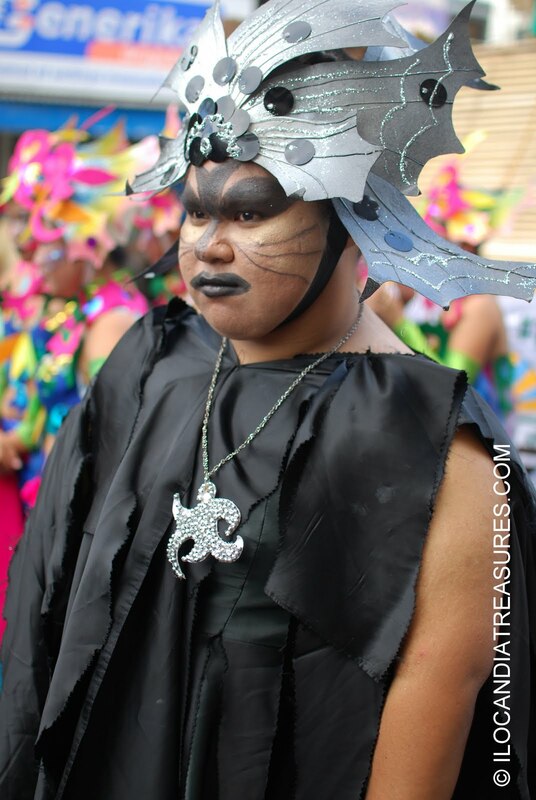 There are around 280 calesas in the city and few of them participated in this parade. With sponsorship from the various business establishments they decorated each calesa with baloons, flowers, and of course the indigenous products available. The winners for the most decorative calesa were entries from Data Center and Genevieve as fist place and second place respectively. 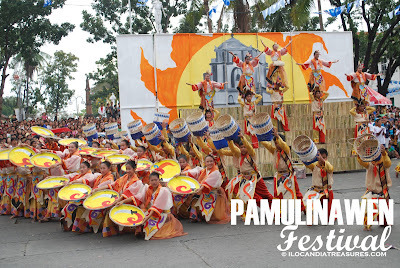 It’s Pamulinawen Festival once again in the City of Laoag. One of the highlights of the festivities is the dulang food fair. Every year I make it appoint that I attend to this event. It’s an exciting one that you don’t just sample the food but be able to learn something about cooking and the Ilocano culture. They have a theme for each year and this time was lubi-lubi or intayon makilubilubi. 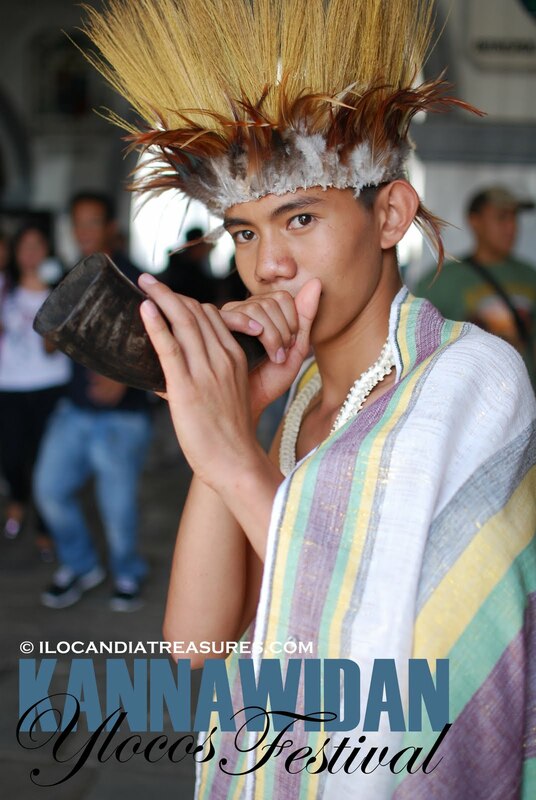 Aglubilubi is part of the tradition of the Ilocanos where a group of teens or adults converge to do lubilubi. They take with them new friends and introduce to the group. They do lubilubi as a bonding session. Each participant shall bring his or her contribution for the lubilubi such as the ingredients for it. One may bring boiled bananas, condensed milk, grated coconut, margarine and sugar. Of course, it won’t be complete without the alsong and al-o or mortar and pestle to pound the ingredients. The boys are the ones in charge of pounding while the ladies put in one by one the ingredients. Everyone participating shares light moment with the group. 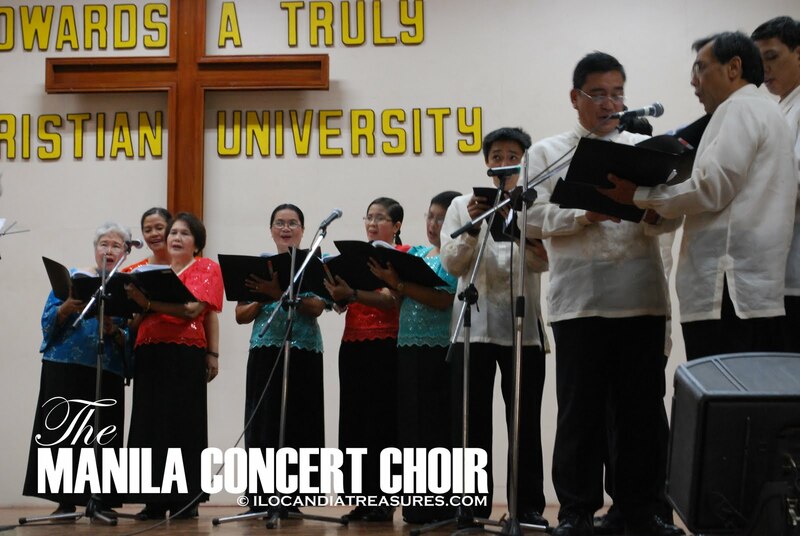 Most of the times, this is the opportunity where love blossoms among couple friends and they court each other by following it up with tapat or harana (serenade). This is a very interesting theme but a tradition that was gone. This is no longer done today because of the influence of modern lifestyle. I would advocate for the preservation of this culture. I was surprised that lubi-lubi products ranged from various ingredients. There is mongo seeds with glutinous rice and grated coconuts and were pounded together. 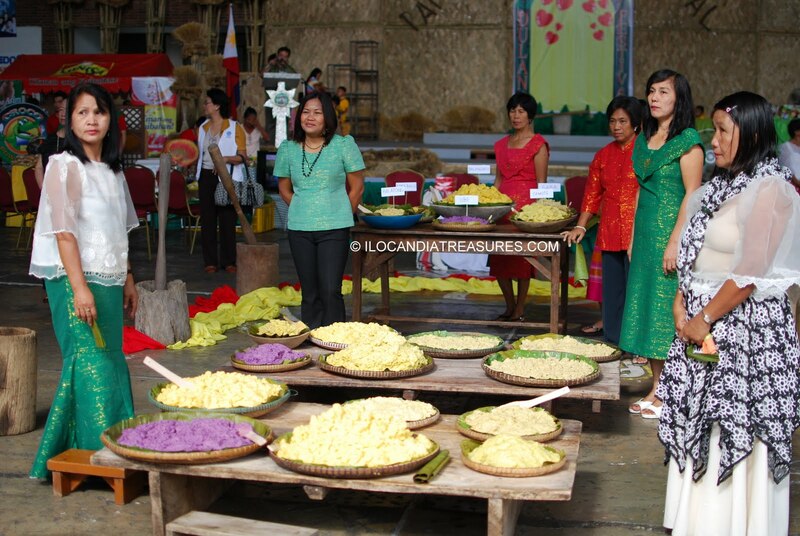 Cassava or balanghoy, ube, sweet potato, rimas, taro, togue and others can be used as a base ingredient. Many restaurants have participated in this event. Dulang means table and this is where the name of this food fest was derived. Each participant has laid down their most valued food in the table to offer to the public for tasting. 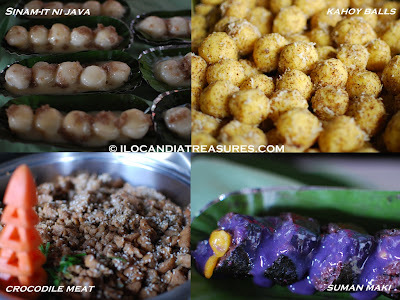 I was able to sample the best desserts of Java Hotel called suman maki with glutinous rice, ripe mango strips and wrapped in nori sheet topped with luscious ube sauce and the other one is sinam-it ni java, glutinous rice with filling of yema topped with coconut crème sauce with milk and sprinkled with ladek or latik. 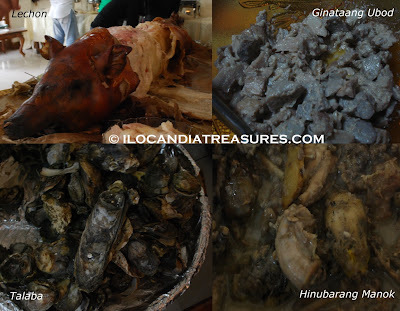 I have seen crocodile meat offered by Croco Restaurant, malunggay products such as pretzels, noodles, sticks, and polvoron. There was also agkalti of tinudok which I ate and sugar cane juice. 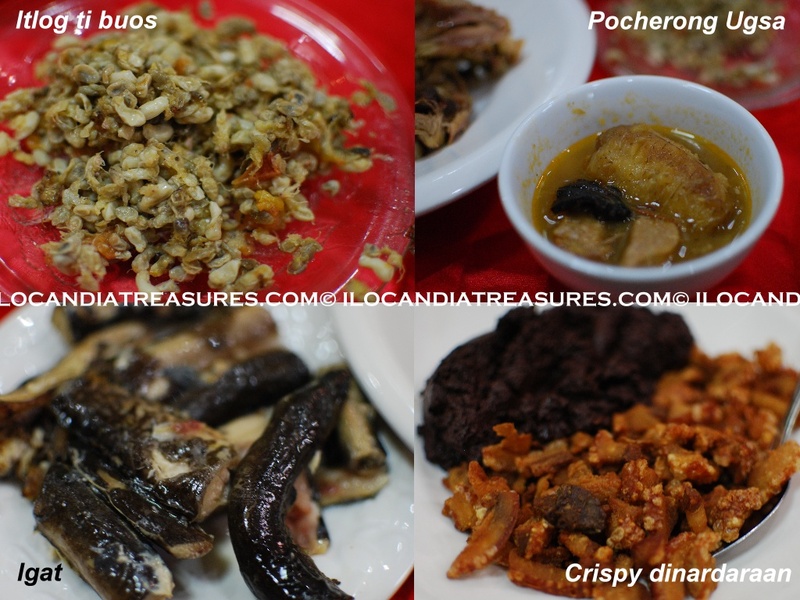 There were other dishes offered such as miki, arrozcaldo and many others. There was a performance by a group of children and two beauty queens from Hawaii graced the event namely Shanette Kalani Diaz, Mrs Hawaii Filipina 2010 and Marnelli Joy Basilio, Ms Oahu Filipina 2010. For the past years, I have been attending various festivals and I have seen Ati-atihan as the best one. It was already my ninth year to attend this celebration and the fun and excitement doesn’t fade. This is a feast held annually in the town of Kalibo in the province of Aklan. It is being concluded usually on the second weekend of January. It is now on its 799th year and it’s the longest running festival. The celebration is in honor of Sto Nino or Infant Jesus. There are tribal dances, music, indigenous costumes and weapons being shown. 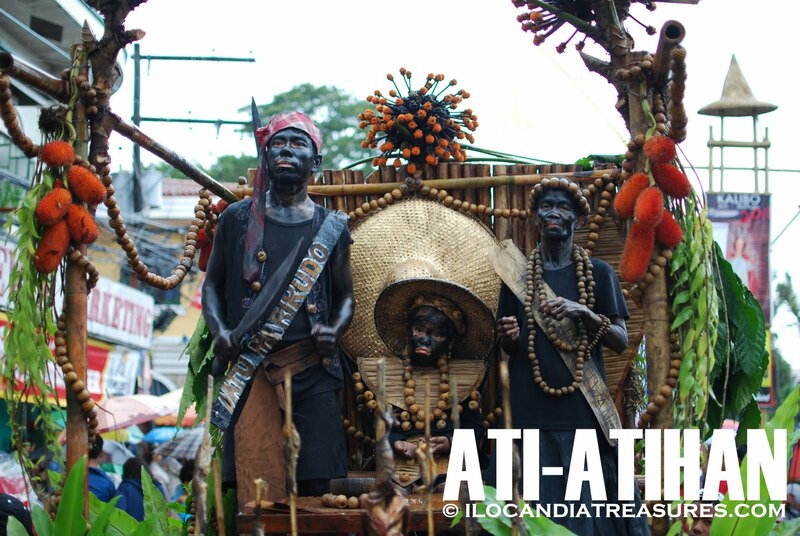 The highlight is the religious procession of the different images of Sto Nino. To celebrate the innocence of the Infant Jesus, some old people dress up like a baby with pampers and huge feeding bottle. Some dress up like a crazy person and some even cross dress. There is also palapak at the church to serve as a healing ritual. 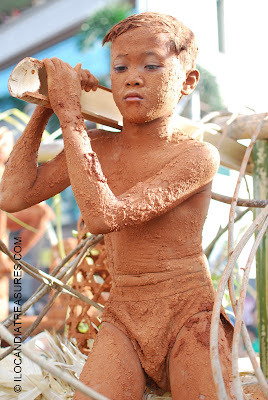 Originally, this is a pagan festival by the tribe group of Ati people practicing Animism where they worship their anito god. It can be traced back to the 13th century where a group of ten Malay chieftains fleed from the island of Borneo and settled in the Philippines and were granted settlement by the tribes people in Panay Island. Then the Spanish missionaries added Christian meaning to it then it became a religious festival. What I like most in this event is that I and everyone could join the dance parade going around the plaza and downtown with the rhythmic drumbeat. They have several tribal groups where you can join in. They call sadsad for dancing in the street. Some groups offer you free beers and wines sometimes in an awkward way. I have seen the beer placed in an unused brand new toilet bowl and serve you with an unused brand new plunger. Oh, its kind of a fear factor thing. I have tried this before. Pulutan is also free where they bring along with them roasted chicken or grilled fish where you can pinch it to have a bite. You don’t get tipsy when drinking because you perspire a lot while doing sadsad. It was fun this year that my colleagues from The Ilocandia Photographic Society were there also to witness this mother of all festivals.